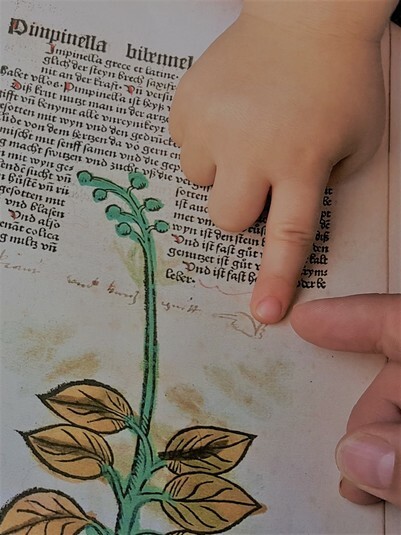 Kommentar: This picture is of my daughter discovering a manicula in Johannes von Cuba's "Gart der Gesuntheit", a text which will be included in my Early New High German Medical Incunabula Corpus. This corpus is my dissertation project and will be used to analyze the lexical and morphological vernacularization of German medical vocabulary from 1450-1500. Although this excerpt is particularily interesting, my favorite 'little hand' in this picture is my daughter's. She gives me the motivation to keep pushing forward each day.